Your iPad comes with the iPod App preinstalled, so you can load up your own tunes and listen to them whenever you want. But if you want access to a broader range of music, here are some iPad apps that can help bring those melodies to you. Ever heard a song and wondered what it was called or who was singing it? Just launch Shazam and point your iPad’s microphone at the source of the music. In a few seconds, the song title and artist’s name magically appear on your iPad screen. Pandora Radio is one of the coolest concepts ever. You tell it the names of your favorite musicians and songs, and then Pandora creates an instant personalized radio station that plays only songs that exemplify the style of music represented by the artists and songs you named. 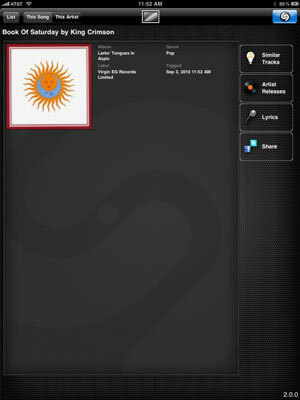 If you love music, you’ll love This Day in Music, an app chock-full of music trivia and facts. Look back in time to discover important events from the music world that took place on this date. Who was born? Who died? Who had a first hit single? There’s a multiple-choice music quiz, music trivia and facts, and you can discover which stars share your birthday and what song was Number 1 on the day you were born.